It’s just better if you don’t ask any questions. 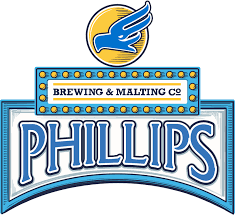 Although not the oldest brewery on the island, Phillips is by far the most mature. In addition to the iconic Blue Buck — yes, it’s not objectively “great”, but the fact that it’s the most popular beer by far on Vancouver Island, outpacing your Molsons and Lucky lagers, is still an incredible accomplishment — they produce a wide-ranging lineup of beers that run the gamut from fruit-infused seasonals to really hoppy IPAs, which you can find at pretty much every liquor store on the Island and beyond. When our reviewers were asked to name their favourite Phillips beer, the list included a sour, a porter, an ISA, a wit, and a DIPA. In short, they are good at everything. With such a solid lineup it would be easy for Phillips to get complacent, but they continue to put out new beers regularly in all sorts of styles. They also make strategic use of their back catalogue, occasionally bringing back old brews for a short run or to round out their annual beer advent calendar. The tasting room is a compact but comfortable space with a few kitschy flourishes that feel right for their brand (think antlers on the wall and hand-painted signs). There are a few bars where you can comfortably rest your tasting flight and chat with friends but unfortunately no seating. Phillips is currently in the midst of building a new tasting room which will open in 2018 and we’re looking forward to see what improvements they unveil, given their commitment to visual flair in other elements of their branding. But they also has a secret weapon hiding out behind their tasting room: a huge backyard space that is used to host concerts, movie nights, dinners and other community events throughout the year. If you’re in Victoria when they are hosting an event in their backyard, we beseech you to go. In a lot of ways, Phillips is the Parallel 49 of Vancouver Island — heavy on branding, heavy on beers that are good if not great, easy to somewhat overlook in 2018 with so many shiny new additions over the last five years, but incredibly influential and still doing neat stuff. Yes, the craft beer industry in B.C is rapidly evolving, but Phillips still has a lot to offer. you should note that they’re building a brand new tasting room right next door which should be open before summer! its gonna be awesome!